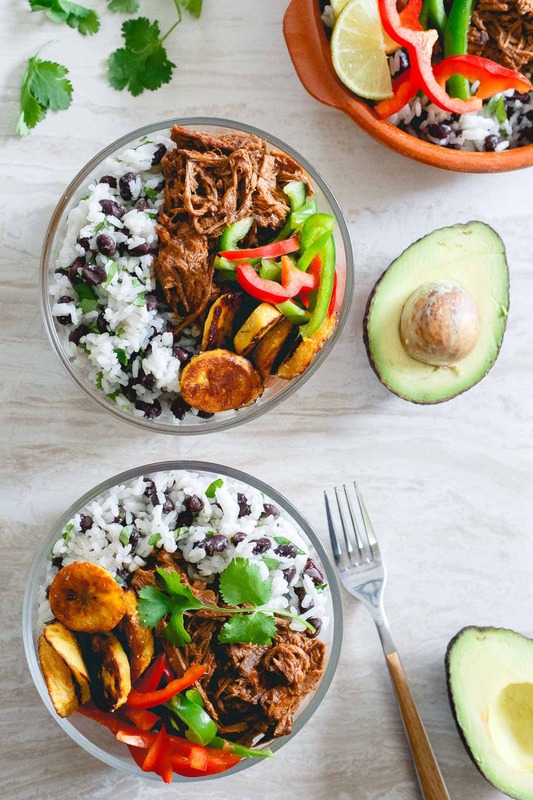 These shredded Mexican beef bowls are made in the slow cooker and perfect for weekly meal prep with rice, beans, plantains and peppers to round them out! Admittedly, I’m pretty horrible at meal prep. When you work from home, the necessity to do it just isn’t there but that’s not to say I don’t often find myself standing in front of the fridge wondering what the heck I’m going to eat for lunch or dinner. Now that I’ve rediscovered those kale feta egg bakes though hopefully that won’t be happening too often any more. Any time I actually do make the effort to cook a batch of protein that will last us for days though I immediately say to myself “why the heck don’t you do this more often?” And since most of the world doesn’t work from home and therefore meal prep is a necessity, these meal prep Mexican beef bowls came to be. Let’s detail all the ways in which having this Mexican shredded beef on hand is amazing, shall we? It’s done in the slow cooker, on low for 8-10 hours, which means this: spend 5 minutes before bed throwing it together (for real, that’s all you need) and wake up to perfectly tender cooked beef. It’ll last you 6-8 servings. If you’re sharing with someone else, that could be 3-4 days of lunch and dinner EACH. It’s just saucy enough that reheating won’t dry it out but not too saucy in that you’d have a hot mess if you wanted to throw this in a wrap or on bread to switch it up. 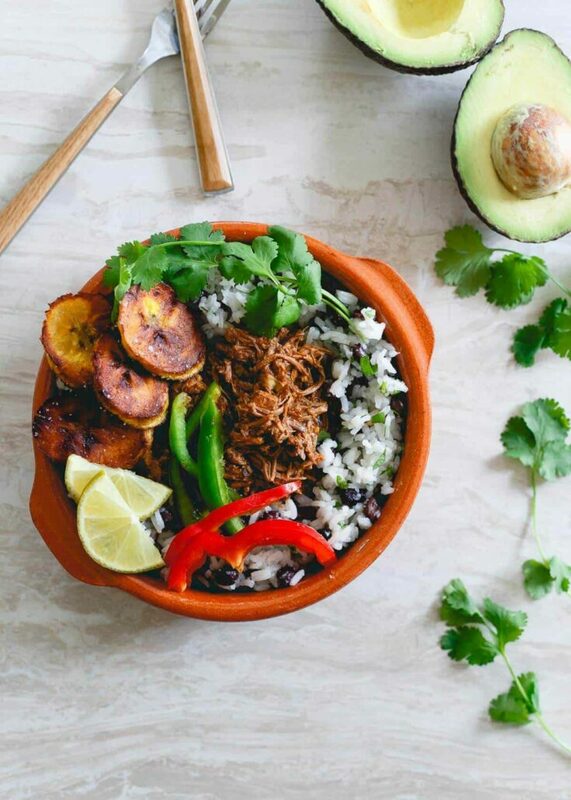 It goes perfectly alongside some rice and beans (equally as easy to prep for the week) and while the fried plantains and peppers round it out nicely, there are a bunch of other vegetables that would pair up great too depending on your preference. They all sound amazing, right? When we were in Mexico a few weeks ago, I made it a point to hit up two hole in the wall taco joints in San Jose del Cabo that I can guarantee you most tourists did not venture out to. When you walk in to find only one waiter who can speak English and every local on their lunch break eating there, you know it’s a good place. The menu was basic and while seafood was the popular filling in Cabo, I had to order at least one shredded beef taco to test it out. While of course, I piled the slaw, guac and salsas high on my corn tortilla (I suffer from taco overloading syndrome, it’s a problem), it could’ve been eaten with just the beef it was that tender and tasty. 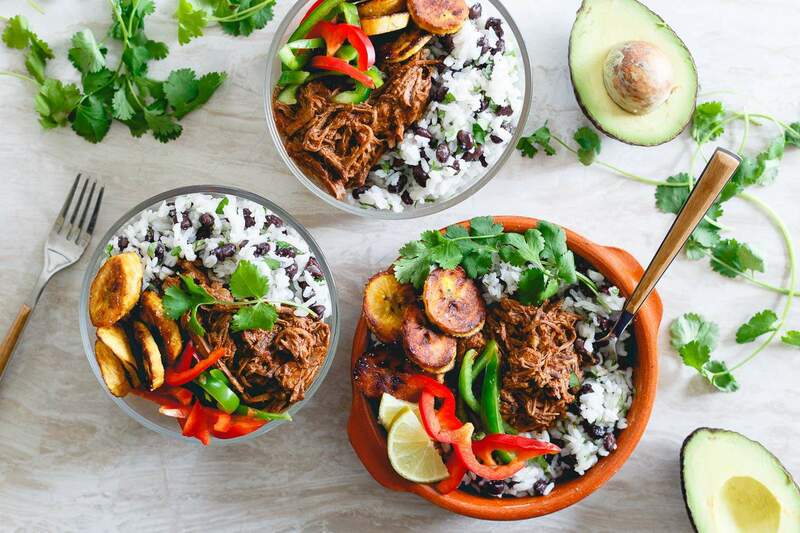 So, meal prep your heart out and eat well all week long with these Mexican beef bowls! Place the beef in the slow cooker. Whisk the remaining ingredients together in a small bowl and pour over the beef. Cook on low for 8-10 hours (works well overnight). Remove beef from the slow cooker, shred using two forks, place the beef back into the bowl of the slow cooker and toss with the sauce. Place the rice and water together in a medium sauce pot over high heat. Once boiling, stir and reduce heat to low. Cover and cook until all liquid is absorbed by the rice. Transfer the rice to a large bowl, add the rice and cilantro and stir to combine. Slice the plantain on the diagonal into 1/4 inch thick slices. Place coconut oil in a skillet over medium-high heat. Once hot, add plantain slices and fry until golden brown on each side. Season liberally with kosher salt. Remove from pan and drain on a paper towel lined plate. Season to taste with more salt. 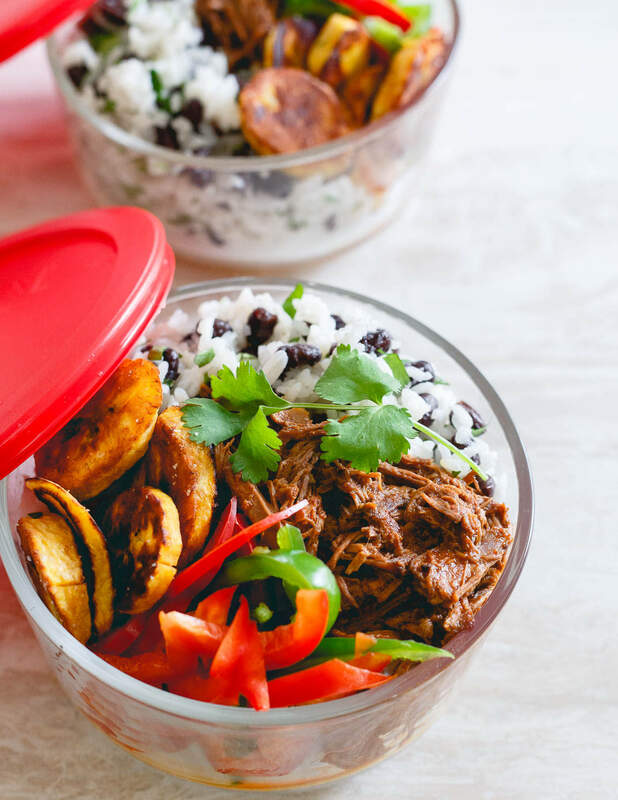 Place an equal amount of rice, beef, plantains and peppers in meal prep bowls. Garnish with a slice of lime and sprig of cilantro. Keep refrigerated until eating during the week. All I needed to see what slow cooker, so count me in on this, looks amazing! These look so flavorful and delicious! I’m totally adding them to my meal plan next week! These bowls look amazing!!! Can’t wait to try this recipe! What a hearty and delicious looking bowl Gina! 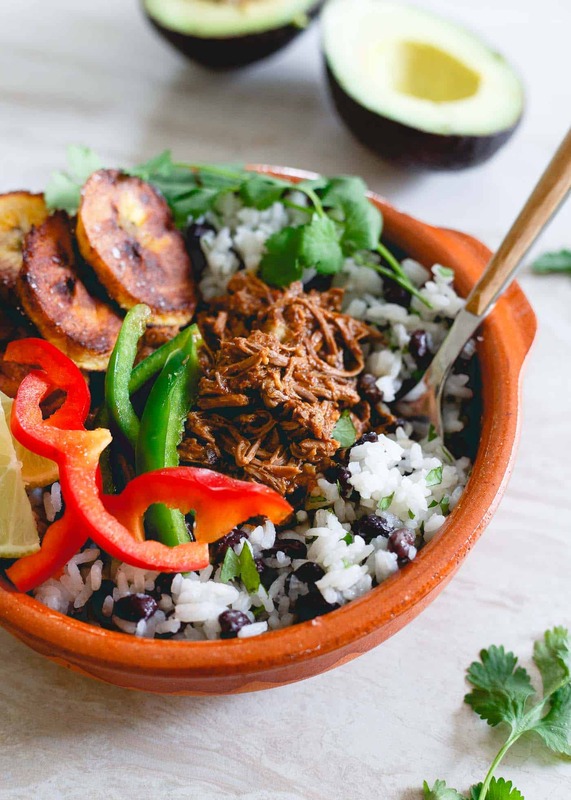 I love how it’s a slow cooker recipe and love the addition of the plantains! I would not have thought of adding them, but it sounds like the perfect idea. Can’t wait to check out the other yummy recipes too. Thanks for sharing! Happy weekend! You had me at slow cooker, and then kept me with Mexican beef! Love the sound of these bowls! OMG story of my life.. Why don’t I do this more? Is what i think. And then I get inspired by more, like these BEEFY BOWLS! LOVE this!! Bowls like this are seriously the best! Nice recipe, I usually forget about plantains, so thank you for this recipe and that reminder! When did you add the black beans ? Sorry about that- just realized that’s not in the rice directions section. Just add them after the rice is cooked with the cilantro. Did you use a rump roast or chuck roast? I can’t imagine those cuts not shredding after cooking all night, I’ve never had that happen. These shredded mexican beef bowls look delicious, I just want to devour it off the screen! Thanks for sharing, Gina!